How much water is used to produce crops each week? Includes crop, cover crop and weed transpiration, as well as evaporation from the soil surface. Hoeveel water word weekliks verbruik vir gewasproduksie? Dit sluit in transpirasie deur gewasse, dekgewasse en onkruid, asook verdamping vanuit die grondoppervlak. You can find more information on using the Actual Evapotranspiration in the March 2015 newsletter. The difference between an optimal and actual ET for a given area. A high deficit means plants are experiencing water and/or other stresses. Die verskil tussen optimale en werklike totale verdamping van 'n oppervlak. Groot tekorte wys die plante word te min besproei of beleef ander strestoestande. You can find more information on using the Evapotranspiration Deficit in the March 2015 newsletter. How efficiently are plants using water? 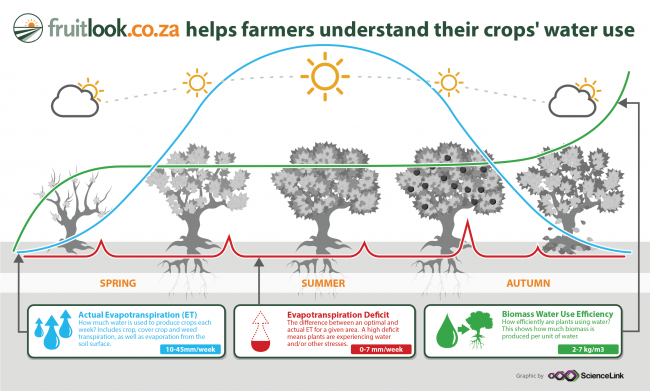 This shows how much biomass is produced per unit of water consumed by evapotranspiration. Hoe doeltreffend verbruik plante water? Dit wys hoeveel biomassa geproduseer word per eenheid water verbruik. You can find more information on using the Biomass Water Use Efficiency in the April 2015 newsletter.